Buying a house is an extremely inefficient, and very expensive, process. Not only is it mostly still done on paper, and with in-person meetings, but it also involves real estate agents who take big fees and who supply information that, for the most part, the buyers can find out on their own on the Internet. It's an industry that, in many ways, hasn't caught up to the digital age. 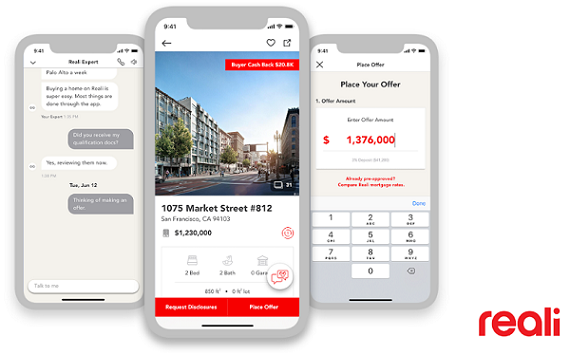 Reali is a real estate technology company that wants to completely transform the home-buying and selling experience, making it mobile, digital, faster and cheaper by using artificial intelligence to streamline the process. "What we come to solve is the significant inefficiency in the real estate market: the ways transactions are being held, the poor experience for many consumers, a lack of technology and, last but not least, it’s also very, very expensive. We try to solve it all by creating a totally new platform for real state transactions, leveraging and providing the services you would expect in the old world but in a very modernized way," Amit Haller, CEO and co-founder of Reali, told me in an interview. On Wednesday the company revealed that it raised $20 million in Series B funding led by Zeev Ventures, with participation from Signia Venture Partners and other investors. This round brings the company's total funding raised to date to $30 million. Founded in 2015, Reali makes buying a home cheaper by doing away with commission fees, instead implementing a flat transaction fee, which it says can potentially save home buyers tens of thousands of dollars. "The way the real estate market works is there’s a 5 to 6 percent commission which is paid by the seller, and then split by two different agents: the agent that represents the seller and the real estate agent that represents the buyer, and they each get 2.5 to 3 percent," Haller explained. "If you buy through us, since we are going to receive the commission of the buyer agents, the 2.5 to 3 percent, we going to refund you back the entire commission, other than a small flat rate that we are keeping for our business. If you sell with us, instead of paying us those very hefty commissions, we are going to charge you a flat rate for a superior service." The amount saved will, of course, depend on the market and the pricing. For example, in California, the savings can be over $20,000 due to the high price of the homes there. The average house in the Bay Area is roughly $1.7 million, and with a 2.5 commission, that's about $40,000. Reali's flat rate is $9,950, so that's a savings of $30,000. "How can we do that? It’s because we’ve become very efficient on our end. Our real estate agents are salary based, we created a very extensive platform with tools for workflow and team collaboration solution on our back office which make us so efficient and we shift this entire efficiency saving back to the consumer as a major saving on their transaction." The majority of the people using the platform right now are Millenials, simply because that group represents more than half of current home buyers. "It’s really understanding the new generation of buyers, what they are looking for. Because we understand the buyers so well we can better productize and marketize the houses to be sold on our platform," Haller told me. "Technology allows us, at the end of the day, to sell faster, but it’s not just to sell faster for the sake of faster. It’s to sell faster for the good for both sides. We are selling faster and higher, which is definitely good for the seller, but we also sell faster to the right customer, to the right buyer, which is, at the end of the day, better for the buyer. The idea really is to create here a marketplace and a platform that would allow a win-win." In the past six months, Reali has tripled its number of home listings and doubled sales volume and app downloads. The efficiency that Reali touts is enabled by artificial intelligence and machine learning, which can understand patterns and data in a way that a human cannot. "What are looking at is a massive amount of data to analyze and to look and to understand to determine the value. In order to determine the value I need to look at the quality of the kitchens, I need to look into the quality of the counter top, I need to do a lot of image processing. I need to provide a very educated advice to the buyers. ‘You could actually remodel this kitchen, which is going to increase the value of your house. That’s how much the remodeling will cost and, by the way, to do anything other than granite counter top will not add value for you in this neighborhood'," said Haller. "Some real estate agents have this knowledge, but they cannot have this knowledge on all the neighborhoods, all the houses, all the different trends and all the different materials that keep changing. That’s where you never be able to beat AI." The company doesn't just rely on artificial intelligence to give information to buyers and sellers; it combines that with a human workforce that can also answer questions for its users. "We managed to fuse the human intelligence and the artificial intelligence into this new platform. First of all, it’s a mobile app, so the entire user experience is done via the mobile app for the consumer. A lot of it is supported by technology, but whenever you need, there’s a real estate expert, a Reali expert, who is in our back office, jumping in via chat. They will help, will support, will guide you, will walk you though, will advise on anything that has to do with any step in the transaction or real estate," said Haller. A large portion of this new funding will be going toward Reali's product development efforts in artificial intelligence. "AI, for us, is the future, not in order to replace the human, but in order to empower the human. We believe that, in the real estate transaction, the human part is going to be a very important part of it. It is the most emotional transaction, the largest transaction people are doing, and our Reali experts, the licensed real estate agents, are going to continue to be part of it. But you cannot ignore AI and the human, as experienced as they are, as smart as they are, there’s no way they can actually learn behaviors and patterns and trends out of data." The funding will also be going toward geographic expansion; the company not only wants to launch in Southern California, but also to more states by the end of next year, though the company does not yet know which states that will be. "We don’t concentrate geographically, necessarily, we’re going to concentrate on demographics, I would say. We’re going to go to the states and to the big metro areas with, again, high Millennial penetration, big transactions, high turnover of transactions, and high migration areas. not international into the states or city growth areas," said Haller. Finally, the funding will also be used to double the company's current 40 person employee base, expanding its engineering team, its experts and its marketing team. What Separates Reali from other companies in the space, according to Haller, is that it is disrupting the entire industry, rather than a specific part of it. "The big value proposition for Reali is that it’s not just an app, it’s not just an AI, it’s not a different pricing model, it’s not just a different kind of workflow tool for the back office, it’s all of the above. So we took a full stock position and vertical integration of doing everything. We change everything from the ground up," he said. "There’s many companies out there that are trying to do AI for agents, AI for consumers. There’s companies which are doing better workflow processing for agents. There are companies which are changing the business model of the agents, the largest one is Redfin. And there’s companies which are trying to be a better work environment for agents, like Compass. But there’s no single company that took a very bold approach like us and said, ‘We really need to change it all in order to control and to create, from the ground up, a totally new experience for the consumer.’ That’s what we are doing." The ultimate vision for Reali is to do to the real estate space what companies like Lyft and Uber did to transportation. "The vision of Reali, for the real estate industry, it’s like what Uber and Lyft have done for transportation. It’s going to be the prime way that you are going to travel, and it’s almost like you’re going to be upset every time you go to a city that Uber doesn’t operate in and you need to go back to the taxi drivers. I believe it’s going to be the same exact thing five years from now, and hopefully we are going to be the Uber of this industry. We are to change it in many ways," he said. "Transacting real estate over your mobile phone is going to be the normal and actually stepping into a traditional real estate office is going to be the awkward proposition. That’s where we wish to be in five years from now."